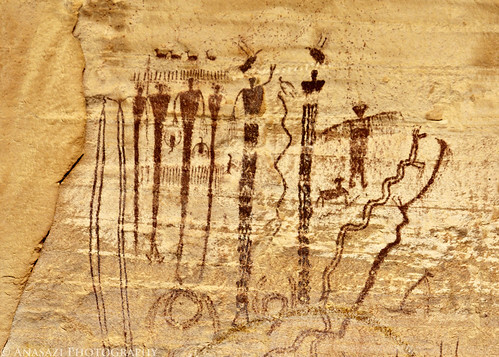 This is just a small portion of the well-known Buckhorn Wash Pictograph Panel located in the San Rafael Swell. Because of the panel’s close proximity to the Old Spanish Trail and currently next to a wall-traveled road, there has been a steady stream of potential vandals passing by this spot for over two centuries……and vandalize it they did. Thankfully, as part of the 1996 Centennial Celebration, citizens of Emery County initiated the restoration of the Buckhorn Wash Panel. While I rarely try to figure out the meaning behind the rock art sites I visit (I prefer just to enjoy them for what they are), I did read an interesting theory about this panel in a book called ‘On the Trail of Spider Woman’ by Carol-Patterson-Rudolph. While this site is usually categorized as Barrier Canyon Style, LaVan Martineau has presented an interpretation that associates these pictographs with the Hopi Snake Dance Ceremony and dates them from AD 1000 to 1300. It’s an interesting theory and I enjoyed reading about it, but in the end, who really knows? The theory did help me come up with a name for this photo, though.